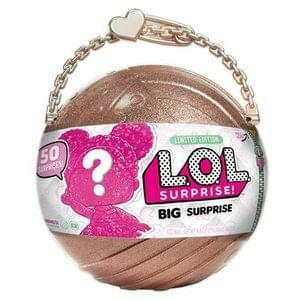 Where can I buy the LOL Surprise Big Surprise? You can order the LOL Surprise Big Surprise from Smyths and Argos. This is a limited edition version of the LOL Surprise dolls, and includes an assortment of 50 surprises inside. Inside you'll find three layers including doll accessories, Charm Fizz balls, as well as L.O.L Dolls and Lil Sisters. The toy is hard to find and instantly became a must-have Christmas present after the company released a trailer video on YouTube showcasing how big it is (see below). Our stock checker will help you track down the best prices and where you can pre-order it. Managed to find stock? Let us know! Tom they’re Not available here either. dionne2 ah sorry yes out of stock now - have marked as expired. Kelsey will look into why Argos above is showing as in-stock when it isn't. They were on pre order at toys r us yesterday at 4pm until about 9 pm when they went out of stock. ElishaA Hi,its the tesco direct massive toy sale ending on the 15th,i got mine online collecting Monday. Sorry ,just checked there out of stock now but there expecting more. how can they never get enough stock. Smyths toys reading gate have some in stock, you have to phone up but I have just bought one. There are 2 more in the shelf. Tesco let me order and pay for one online. Then 10 minutes later emailed me to say they have to cancel my order as theres none left! I read that a new delivery is expected at the Toys R Us distribution centre at the end of this week so some stores should have it on sale by the weekend. Also Smyths are expecting new stock around 26th October - 2nd November. The Entertainer has then in stock now!!!! Anyone any updates on where will have these in stock?? Go to Amazon France, they have them in stock right now! Amazon Fr has a 1 to 2 month delivery date though so you won't get them quickly! How much did you pay please? in stock but Total with delivery is £89! I’ve bought one hope my little girl is happy! Don’t want to risk waiting and not being able to get one in time for Christmas, it’s the only thing she has asked for. just looked they are 200 euros! I paid the retail price with no delivery, I think that’s due to me being a prime member though? Stockchecker stated 'out of stock' in salisbury argos, I was in argos for a different item and put in the number for big surprise ball lol and it came up '3in warehouse I managed to get the 2 that I needed, check in store! Asda direct had them available! LOL Surprise Big Surprise is a giant gift that'll make you very excited. The universe where babies rule, Rockers rebel, and Teacher's pets become class presidents. Each layer hints and what doll you're going to get. A secret emoji message, collectible stickers, charms and more. What will you get?